Congratulations to our 2018 Teacher of the Year Gina Thompson (left), 8th Grade Algebra, Tindley Collegiate Academy, and Teach Like a Champion honoree Allison Kempers (right), both pictured with Board President Tom Cebulko. ﻿Teachers’ Treasure the Slaughter Family, and the American College of Education (ACE) are pleased to announce that the nomination process for the 2019 Teacher of the Year award is now open. In 2019, up to three teachers will be selected and presented with a cash award, underwritten by the Slaughter Family. In addition to the cash awaards, partial scholarships provide by the American college of Education will be awarded. As the original underwriters of these awards, it is the intent of the Slaughter Family to recognize teachers who serve in transformational ways – ways that demonstrate change in an individual, group, class, or school – and exemplify honor to the profession. The cash awards they provide are to be utilized personally as a way to enjoy the fruits of their labor. One cash award of $2500 plus a $4000 ACE scaholarship ($6500 total value) will be provided to the Teacher of the Year and up to two “Teach Like a Champion” cash awards of $1,250 plus a $2000 ACE scholarship ($3250 total value for each) will be presented as well. Nominations can be made by a teacher, group of teachers, or administrator. All nominees must be a registered licensed teacher who is a current and active shopper at Teachers' Treasures. We look forward to reading your nominations, due January 5, 2019! 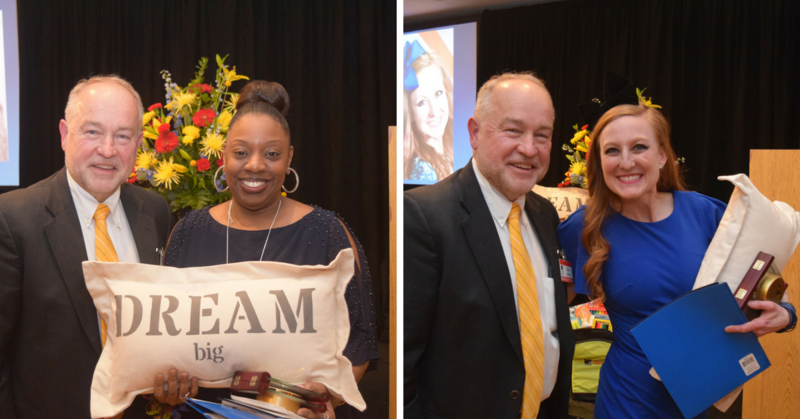 The Teacher of the Year winners will be honored at Dream Big! in March 2019.